You are here: Home / Amazing Tips / Are Clams Good for Health? Are Clams Good for Health? People often reject clams due to their salty taste and chewy texture. However, clams, whether fresh or canned, have numerous health benefits. Being high in protein and low in fats, they are also great for those on a diet. Plus, you can pair them with different vegetables and grains to improve the taste as well as nutritive value. You can also cook this superfood from the sea in a variety of ways by steaming, baking, frying or sautéing them. Here are some of the health benefits of clams. Clams have high levels of vitamins A, B, and C. B vitamins in clams include vitamins B1, B2, B3, and B12. In fact, it is one of the best sources of vitamin B12. A 100 gram serving of clams can provide about 1000 mcg vitamin B12. This vitamin, also called cobalamin, stimulates metabolism, converts carbohydrates into glucose to give energy, helps produce red blood cells and regulate the central nervous system. It also reduces the risk of dementia, and protects against heart disease and certain cancers like lung, colon, breast and prostate cancers. Clams are low in unhealthy saturated fats but high in omega-3 fatty acids which are polyunsaturated fats. A three-ounce serving of clams offers about 0.25 mg of omega-3 fatty acids. Omega-3 fatty acid is an essential fatty acid that the body gets through food but cannot make. It is a heart healthy fat that reduces the risk of heart disease, macular degeneration and other chronic diseases such as arthritis and cancer. It reduces inflammation, increases HDL or ‘good’ cholesterol and decreases triglycerides. It is also important for cognitive and behavioral function. In terms of minerals, clams are high in iron, even more than beef, steak and liver. Iron plays an important role in the production of hemoglobin and red blood cells. In addition, it strengthens the immune system, builds concentration, and helps transport oxygen throughout the body. Moreover, clams contain trace minerals such as selenium, chromium, manganese, zinc, and iodine. In fact, clams can supply almost 116 per cent of the RDA of selenium for adults. Take a break from chicken and red meat and eat clams a few times a week as it has high levels of proteins, the building blocks of the body. Four large clams of nine small clams (100g) can supply about 14 g of protein. In general, the RDA of protein is 56 mg per day for men and 46 mg per day for women. Protein helps repair muscles and tissues. Clams are believed to have more lean protein than most other seafood species like scallops and oysters. Lean protein helps you with your weight loss efforts by making you feel fuller for longer. Being rich in a number of nutrients, clams are excellent for your skin. The vitamin B12 in clams helps in cell reproduction that aids in maintaining health skin. 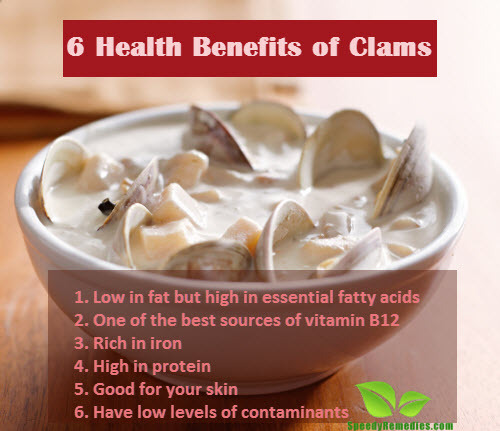 Clams also contain riboflavin or vitamin B2 which helps in the proper development and functioning of the skin. The high protein and omega-3 fatty acid content of this food, too, is good for your skin, hair and nails. They have lower amounts of contaminants compared to other fish and seafood species. The contamination is usually caused by pollution and industrial activity near water. Nevertheless, clams are not completely free of contamination and can still cause symptoms like headache, nausea, dizziness, and tingling on lips, tongue, face, neck, or fingertips. Raw clams in particular, may also be contaminated with a kind of Vibrio bacteria that can cause serious illnesses. So, always go for farmed clams.